Quad QC-twenty four review | What Hi-Fi? This Quad preamp is a really pleasant listen. It's best suited for use with Quad's valve power amplifiers. In 1953, Quad launched its QC II/Quad II pre/power combination. Coming four years before what is arguably the company’s finest achievement, the electrostatic loudspeaker, these valve amplifier designs remain landmark products for those into classic hi-fi gear. The QC-twenty four preamp clearly takes its design inspiration from these early designs while being suitably updated in its execution. And that’s a good thing, because it isn’t easy to buy classic electronics: it takes a certain amount of product knowledge and quite a bit of luck to get a good sample. Even then, servicing and replacing aged internal components needs to be considered. That doesn’t stop the QC-twenty four from being valve-driven, though. It uses a single, tiny 6111 twin-triode valve for amplification purposes, with each side of the valve powering a different audio channel. Valve life varies, and usually these devices need changing regularly. Preamp valves (depending on circuit design) tend to last around 10,000 hours – but Quad quotes a figure of 60,000 to 100,000 hours for the 6111WA. That’s a usefully long life. 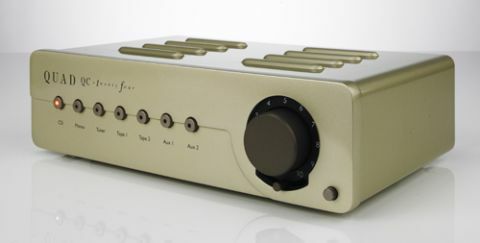 This is a small preamp, in the mould of the original 1950s design and is finished in a suitably retro colour, which the company calls ‘champagne gold’. Build quality is good. The casework feels solid and we like the robust feel of the controls, even the odd lever below the volume control that governs channel balance. There’s no remote control, but that omission doesn’t feel odd here as it would in a modern product. The preamp’s connectivity is good. There are five line-level inputs as standard and two tape loops to go with twin RCA stereo outputs. All connections are single-ended. But while there’s an input marked phono, this is in fact line-level if the preamp is bought in basic form. For vinyl fans it’s possible to get a £150 transistor-based MM/MC phono module fitted inside the QC-twenty four. For those with deeper pockets and more ambitious systems there’s also a dedicated outboard unit from Quad known as the QC-twenty four P, which will set you back £1200. The natural partner for this preamp is one of Quad’s valve power amplifiers. We used the Quad II-eighty monobloc and got really good results. We can’t imagine too many of these preamps being used in non-Quad set-ups, but if they are, care has to be taken to ensure the power amp is well matched electrically. Once given a few days to settle, the QC-twenty four is a likable preamp. It has a sweet, full-bodied balance that sounds even-handed and relatively detailed, and doesn’t come across as an analysis tool – rather, it’s for the listener that just wants to sit back and enjoy their music. Listen to The Unthanks’ Here Comes the Tender and this Quad preamp bathes the sound in a golden glow that brings out the beauty in the vocals and arranges the instrumentation in a neat way. While not the last word in openness, dynamics or rhythmic precision, this preamp has enough organisation and drive to keep the listener’s attention. Move onto something harder-hitting, such as Jay-Z’s Blueprint 3 and we’d like a bit more zip to the sound and more punch, but in its own way the Quad still delivers a sound that keep our interest. There’s an appealing composure to the presentation, and enough dynamic finesse to keep things engaging. Switch to Arvo Pärt’s Litany and the QC-twenty four shines. It sounds subtle, smooth and defines small-scale dynamic shifts well. There’s no trace of harshness here, either. It’s a really easy listen, and we mean that in the nicest way possible. This distinctive preamp isn’t an all-rounder, but in an appropriate system built around the Quad valve power amplifiers it delivers a really likeable performance. Retro it may be, but there’s still plenty to appeal to a modern audience.